Endeavour 3DSecure, the most comprehensive solution for 3DSecure on the market today. 3DSecure is the only technology which connects Merchants, Cardholders, Issuers and Acquirers in such a way that transactions can be conducted online with complete security and no fraud. Merchants benefit from liability shift from chargebacks, cardholders are protected by their authentication and banks can approve funds in complete confidence. Numerous countries around the world have now mandated the use of 3DSecure for Issuers in their territory, requiring merchants accepting payments from these countries to support it. Endeavour 3DSecure is the best solution for any Merchant, Acquirer or Payment Gateway seeking to add 3DSecure to its online operations. What makes the ideal 3DSecure product? It should be affordable, easy to start using, deliver high performance and reliability at all times for optimal user experience, provide excellent reporting and analysis to identify even the slightest glitches in payments, and be backed up by a great company. Endeavour MPI provides a hosted and managed PCI-DSS certified solution with easy integration via a rich API. The platform has been engineered from inception to deliver optimal performance, outstripping other MPI products by orders of magnitude in response times. Maintenance and business continuity are part of the design and never require down time. The online reporting console provides powerful and insightful reports. Time zones and language character sets are seamless handled by the console. Support is always available to identify underperforming Issuer platforms and expedite solutions. Thanks to ongoing monitoring, Endeavour takes a proactive stance towards support, regularly contacting clients with warnings or suggestions. The current standard of 3DSecure is 1.0.2 and has been going strong for well over a decade. The next generation 3DSecure is 2.1. 3DSecure 2.1 is the technology which will drive payments and innovation into the next decade. 3DSecure 2.1 will provide frictionless authentication, risk based step-up challenges and native support for mobile devices. Endeavour is one of the early adopters of this new standard. Its SDK will enable mobile payments to be seamlessly authenticated directly from within the app and with little effort for developers. 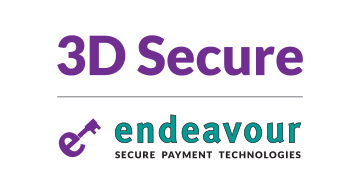 Thousands of merchants and leading payment providers trust Endeavour as their partner for 3DSecure. Be part of our dedication to build a better payments future. Verified by Visa, MasterCard Secure Code, Amex Safe Key, Diners Protect Buy, JCB J/Safe and MIR. For more information, contact us at www.3dsecurempi.com or visit us on stand K50.